Taking me back to the days when I used to work for a well-known fast food restaurant, the Rascal Flatts' new music video for their most-recently released single is a very loved-up cute visual. This is exactly what we needed to see to restore humanity's ideology on love. It's quite the flip to the song I've had stuck in my head all day, which was Cassadee Pope's "Piano", but since she never released a music video for it, I came across this other country song instead, and I honestly like the Rascal Flatts' a lot, so this was the next best thing. Watch the Rascal Flatts' perform in an American diner, while we watch a loving relationship visual play out in the "Yours If You Want It" music video. 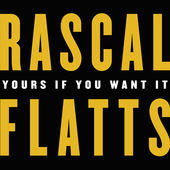 The Rascal Flatts are a country trio consisting of Gary LeVox, Jay DeMarcus, and Joe Don Rooney. They are one of the biggest country music acts in America, who has had occasional success internationally, notably with "Bless The Broken Road", "What Hurts The Most" (a cover of Jo O'Meara's "What Hurts The Most", later covered by Cascada, also titled "What Hurts The Most"), and "Backwards". They need a massive international hit, but it's hard to send country music outside of America and Canada, it's not impossible, but it's just completely rare. If others can do it, then the Rascal Flatts can too, it's only a matter of a time. This song is completely lovely, but it's just that. It's the first cut from their new album titled "Back To Us", which sounds like the album we all cannot wait to hear. The song was written by Andrew Dorff and Jonathan Singleton. This song and music video is in honour of country music songwriter Andrew Dorff, the co-writer of this song, who passed away last year. The song is full-on country, just the way we like it, allowing Andrew Dorff's legacy live on, as Jay DeMarcus stated in a Rolling Stone interview. The video was directed by Billy Zabka and has two parts, a full-out narrative and an energetic performance piece. The narrative stars are actor Kevin Farley and actress Kristy Swanson. Kevin Farley plays a customer at an American diner, whereas Kristy Swanson plays a waitress in the said American diner. Both stars are well known from various films and TV shows, hence why you may recognise them. The narrative unfolds seeing Kevin Farley asking Kristy Swanson out on a date after her shift. The story continues with some incredibly cute loved-up moments, some we'd love to have ourselves one day. We even see him propose to her. All before returning to the American diner, finding out that it was all a daydream. Luckily, that isn't how the narrative completely ends. Kevin Farley's current girlfriend tells him to hurry up, and Kristy Swanson gives him her number, letting him know that she is actually interested in him. Could that so-called daydream have been a premonition of what is to come? As for the Rascal Flatts' performance, it links in perfectly with the narrative, as the trio are acting as the part of the restaurant's staff. Gary LeVox, the vocalist and frontman, can be seen flipping burgers and singing the song under his breath. Jay DeMarcus and Joe Don Rooney also take part in the narrative as well, with individual slight scenes. Their performance of the song, is completely energetic, as usual, with their constant positive vibes. Imagine seeing this trio live on stage - that would definitely be one night we would never forget. However, there is too much focus on the narrative and not enough showcasing the performance piece. There is much more that could've been done with this music video, and it's just missing that oomph, that special something that can be seen within most music videos.